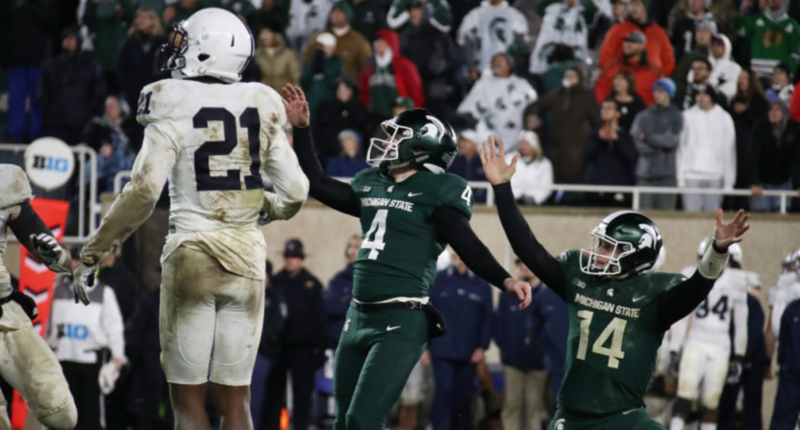 Penn State's College Football Playoff hopes are gone with Michigan State's upset victory on Saturday. When Penn State and Michigan State kicked off in Spartan Stadium just after noon eastern on Saturday afternoon, nobody knew what was about to unfold in the Big Ten during the next seven and a half hours. It is one of those great unknowns and sports cliches that you never know what is going to happen when a game kicks off. What happened the previous game never guarantees what will happen in the next. For Penn State, a chance to remain on the College Football Playoff radar was on the line as long as they could get out of East Lansing with a win. For the Spartans, the playoffs had long been removed from the realm of possibility, but a win against the Nittany Lions would set the stage for a shot at the Big Ten East Division crown next week against Ohio State. In a game that was interrupted by a weather delay of roughly three and a half hours, Penn State whiffed on what could have been a golden opportunity to jump right back in the playoff discussion a week after losing on the road at Ohio State. After falling in the final seconds to Michigan State, Penn State’s playoff dreams are now gone for good this season. Even when Ohio State got run out of Kinnick Stadium by Iowa in a blowout nobody could have predicted, Penn State still could not manage to take advantage of the situation to potentially still have a shot at returning to the Big Ten championship game. Saturday was the day Penn State’s season came to an end, with three games still to play. Don’t look for Penn State to pack things up and just go through the motions the next three games. There is still a decent chance of going 10-2 for a second straight season. Yet this year, going 10-2 is a disappointment for so many reasons. And perhaps that’s actually an encouraging sign for the program and the direction it’s heading in the bigger picture. Sure, this was a playoff-or-bust season with what was coming back from last year’s Big Ten championship ride, and things certainly started off well for the Nittany Lions. After shredding Michigan in a revenge game in Beaver Stadium, Penn State was ranked second in the nation in the AP poll just before the debut of the playoff rankings. Blowing a double-digit lead at Ohio State and losing by one last week was a tough pill to swallow, but it was far from the end of the road. Losing at Michigan State was the ultimate punch to the gut, though. It not only knocked Penn State out of the playoff running, but made it nearly impossible to play for the Big Ten championship again. And it may have been a devastating blow to the Saquon Barkley Heisman Trophy campaign. That is a shame because Barkley is a truly special player who is seeing his Heisman stock diminish each week over the past month. He’ll still get to New York, but his favorite status has slipped away to some quarterback in Oklahoma. So what exactly gets Penn State motivated the rest of the way? With no playoff shot and no Big Ten title shot, Penn State must now focus on getting to 10 wins. With Rutgers, Nebraska, and Maryland remaining on the schedule, a 10-2 season is entirely possible and should be expected. And at 10-2, there may still be a shot at playing in a New Years Six bowl game, but even that feels like an outside shot at best right now. Last week, James Franklin stressed that they cannot afford to let Ohio State beat them twice. This week, Franklin needs to find a way to not let Michigan State beat them twice. We’ll see just where Michigan State is heading after this. Obviously, a win against the Buckeyes would give Michigan State the inside track to the Big Ten championship game. The Spartans already own the head-to-head tiebreakers with Penn State and Michigan. Adding one against the Buckeyes would mean Michigan State would have to lose their final two games to open the door for either of those three down the stretch. No matter what happens in the next three weeks, Michigan State has already proven what happened with their 2016 season was a mild blip on the radar for Mark Dantonio and his program. These Spartans are never to be counted down and out.